If you're like most people, you don't like – perhaps even hate – your teeth. But did you know you can now design your own smile? ✔ …and your satisfaction is guaranteed. “I used to hate smiling before I went to this dentist. My teeth were all crooked, I got the invisible braces fitted and now 6 months later my teeth are beautiful I love them now and can't stop smiling. Just wow I'm so happy and overwhelmed by this. I'm like a different person now all smiles and love my teeth. Thank you so much for everything." “I used to hate my smile so decided to go for braces. Mr Ewan was very helpful and confident that he could achieve the result I was after. I now love my smile it's boosted my confidence and can't thank them enough for all their help. I would recommend this dental practice to anyone. They are absolutely fantastic in all aspects, thank you so much." 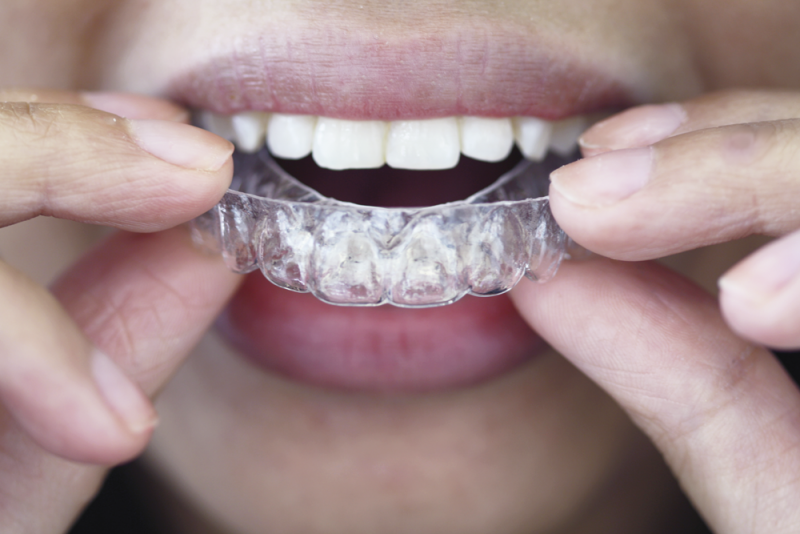 Our new – virtually invisible – braces are probably the quickest way to a gorgeous smile. Take a look at the picture on the right and see just how invisible they are. Most customers begin to see results in just a few weeks. And the entire process takes under six months – twice as fast compared to many alternative treatments. And – of course – we guarantee you'll be delighted with your new smile. 3 simple steps for the smile you've always wanted. - It’s easy – and free: just accept my invitation for your free, 20 minute consultation. or click here to fill a quick enquiry form. We’re expecting you. -Is your free consultation. It's completely painless. Find out about you: why you'd like the treatment and any concerns you might have. Fully explain the treatment – and costs. Give you an idea of how long it will take. Show you how it works. Take two photographs: one full face, the other from your nose to your chin – we call this the smile photo. And finally, we take a full, accurate 3D scan – no dental impressions - of your teeth. Then – and only if you want to – you can actually see the kind of smile you will have when the treatment is complete. How? At your smile design appointment. Jake - your in house smile designer – will use the 3D scan taken at your consultation to show you how we can improve your smile. You'll spend 30 minutes with Jake making sure you are 100% happy with how your smile will finally look. If you want any changes made, Jake will do it – so long as it's possible, of course. So why not book your free consultation now? or click here to fill a quick enquiry form. “Ewan Bramley Dental Care was recommended to me by several different people and I am so pleased I decided to have my treatment done here. “I visited a different practise for a consultation but as soon as I came to Ewan Bramley I felt confident and reassured in the information they were giving me. “The pros and cons were explained fully and there was no sales pitch at all, just information that I requested. “All of the staff are friendly and I could not be happier with my treatment and the end. Everyone's teeth are different. So – to be frank - it's impossible to tell you the exact cost before you've had your free consultation. But to give you an idea ... on average our patients only pay £1000 And - if you want to – you can pay over several months - interest free: from as little as £20 / month. ✔ Free professional tooth whitening – worth up to £300. This includes two hygiene visits to get beautiful, bright, white teeth. And a further two more whitening treatments. ✔ Free practice membership – worth up to £180. ✔ A free dental health check. ✔ Two free emergency appointments. Hurry: Limited spaces – book your consultation today.